What’s in a Name? No, Really. I Want to Know. There is a lifelong debate between those people who say, “What’s in a name? That which we call a rose by any other name would smell as sweet,” (OK, maybe only Shakespeare via Juliet said that), and those who claim that a name is everything—meaning, your name is a part of who you are. I’m curious: Which one is it? If you are forever plagued with a long name like mine, or an exotic name, which could be any name that does not rhyme with Sminnifer, I am sure that you have practiced your verbal response to lazy spellers and confused facial expressions since you could speak. How many times do you typically have to repeat yourself? I know that when I say my name is Jacqueline (pronouncing the “qu” not “Jack-lyn” like some say), I will get any number of strange responses. “Oh, thanks Jocelyn”, or “I’m sorry, what?” Com’on, people, it is hardly a weird name. In fact, I pronounce it like a silly American. You want to get technical, that is “Jacques-LEAN” to you. Preschool was very difficult for me when we got to the part where we learned how to spell and write our names. I happen to have a long French name that never really fit on one line when four-year-old me attempted to write it out. Let me see if I can recreate this awkward time in my life. That is pretty much what it looked like, except that I am sure there was a backward letter here or there for at least the first few months of writing. Do people really look like their names? Let’s be serious. When your parents named you, did they subconsciously give you a name that you would grow up to look like, or do you just look like your name because that is that name that people associate with you? Is there really some behind-the-scenes voodoo magic going on that makes people look like certain names? What about people who change their names, or casually go by their last names? Nicknames? Are there really names that fit body types or hair color? What about Marilyn Monroe? She was a brunette before she was a super star, but when you think of the name “Marilyn”, do you think of a blonde bombshell? Let’s talk about nicknames. I love the name Katherine (or Catherine), which often gets shortened to Katie or Kate. I have many friends who are Katie(s) or Kate(s). When meeting new people, they always introduce themselves as “Katie” or “Kate.” I have also met Katherine(s) who introduce themselves as “Katherine.” Would you ever take it upon yourself to shorten their name for them? 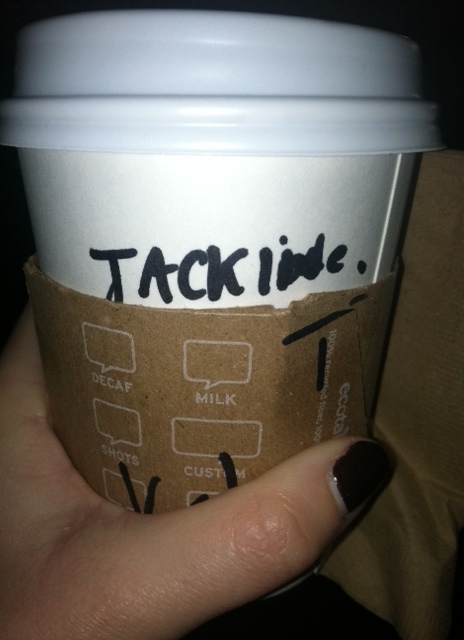 Despite my aversion to long names, I have never been a “Jackie” (my mother forbade it growing up). I have always used the long form of my given name. However, many people throughout my life have automatically taken it upon themselves to shorten my name to “Jackie” as soon as I introduce myself using “Jacqueline.” Why is that? Why do people automatically shorten Jacqueline, but not Katherine, or Elizabeth, or Jonathan? If someone introduces himself with a certain name, by societal rules, are you allowed to change it? Someone once told me that this is an American thing. I would like some international confirmation. I also want to explore the idea that certain names fit certain professions. How many times have you met someone who introduced themselves and then went on to tell you that he/she is a doctor, and you immediately thought, “Wow, his/her name sounds like a doctor name.” Does the name sound like a “doctor” name because that person is a doctor and you are associating their name with being a doctor, or does that friendly voodoo magic come back and pick children at birth to pursue a career based on their given name? I see this kind of association a lot in the arts—actors, writers, directors, painters, etc… People say, “Oh, his name looks/sounds like a writer’s name.” (If this is the case, I hope you think that about my name.) But you have to remember that many artists are actually using pseudonyms, and the name printed on the pretty cover of that book is not actually their given name. This brings up a good question about pseudonyms: Did that writer choose that particular name to use as his own because it sounded more like a writer’s name than his own? If that is the case, perhaps there are in fact names that sound like certain professions, and maybe we are all bound by destiny to fit into a sector of society based on an ordering of letters that our parents may have arbitrarily picked from a book, movie, or billboard advertisement. What does a child’s name say about the parents who named him? Think about your own name. What were your parents thinking? Let’s be honest here, you did not choose your own name (most likely); therefore, your name must have been chosen for you by people whom you also did not choose yourself. You had no say over the name that you will be called for the rest of your life. Are you feeling helpless already? Do certain names belong to certain socioeconomic sections of society? Can you determine someone’s cultural background by the spelling of their name? Think about everything that you can immediately know about someone just from a first introduction. Is he a Junior; IV; named after a mother; father; family name? Names are huge, people. After all this thinking about a name, I have to say that I disagree with Shakespeare’s naïve, love-struck character, Juliet (whose name is now associated with love-at-first-site, youthful ignorance–three days, com’on, and untimely death). While I do not think that you are necessarily a slave to it, your name does carry a ton of weight. There is definitely much more to a name than arbitrarily ordered letters. What do you think? Any cool name stories out there? children's names, name meanings, names, personal stories, philosophy, professions, Shakespeare, What's in a name?